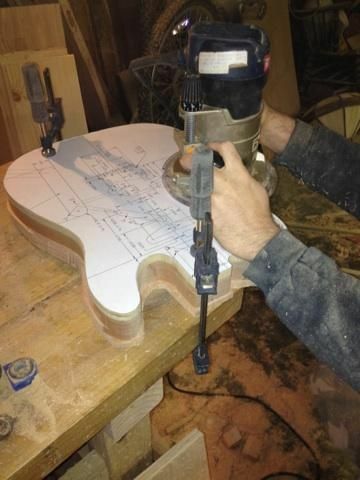 Prior to diving into the world of woodworking, I was a pretty avid guitar player. Throughout high school and into college I played in several punk and heavy rock bands. As I got older, finished graduate school, started my career and family, I stopped playing guitar as much and started making saw dust. 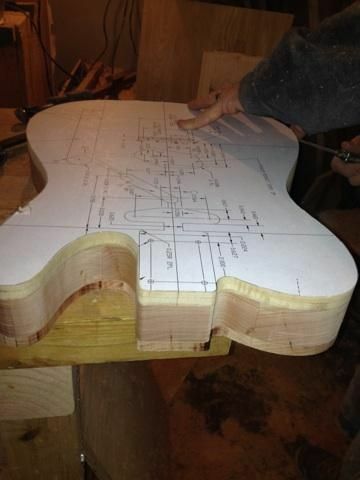 The body is going to be solid cherry – fairly heavy guitar, but don’t plan to do much stand up playing with it. There were actually quite a few more clamps and some cauls involved to keep everything flat – but you get the idea. 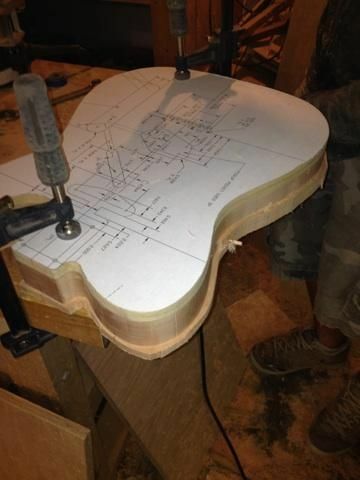 Wasn’t too worried about the ends being square – the guitar shape was going to get cut out. 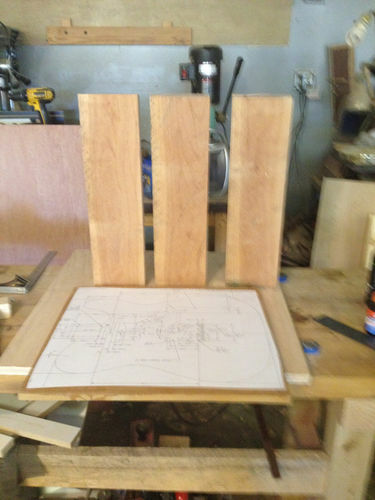 While the body blank was in the clamps drying, we turned our attention to the template for the body. 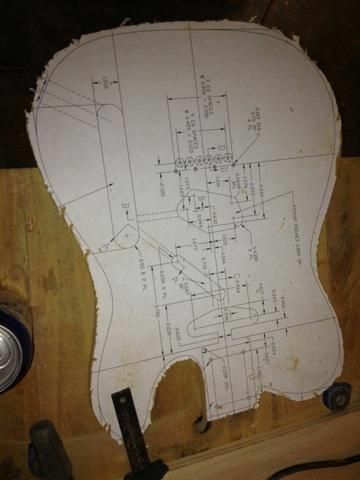 The template came from a telecaster forum. I had a few full size copies run off at Kinkos – 3 copies were about $9. It was much better than trying to line up a bunch of individual sheets of paper. Template was rough cut with a jig saw. Could have used the band saw, but I didn’t want to change the blade out just to put the big blade back on for roughing the body. 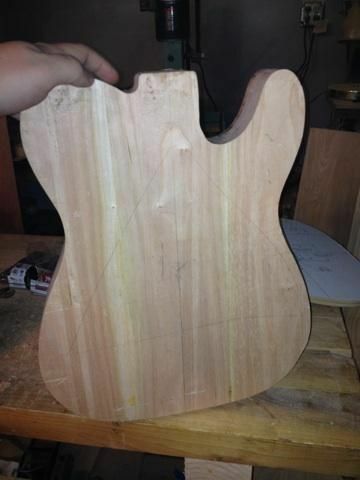 After roughing out the template, we have to clean it up and get it to it’s final shape. Most of the shaping was done on the disc sander. Some of the curves wouldn’t fit and had to be done by hand. This ALMOST made me break down and run to Harbor Freight to get a spindle sander. If it wasn’t 10 at night, I would have been on my way. In all honesty, I wanted to quit for the night, get the sander in the AM, and finish. But my helper was relentless, so we finished it up by hand. 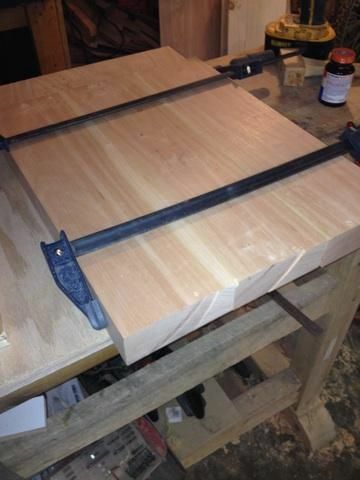 Here’s the template next to the blank after it came out of the clamps. Since we started around 9 am, I went ahead and took the blank out of the clamps, scrape the glue and smoothed it up a little. Next I drew a center line on the blank, lined it up with the center line on the template, and traced out the template. 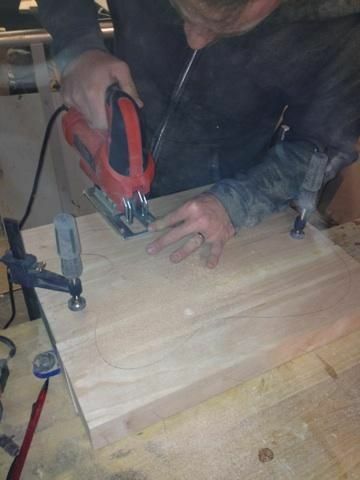 Here I am roughing the body out with a jig saw…this lasted about 10 minutes with very little progress. Then it was over to the band saw to do the rest – DUH. With the body roughed out, I reattached the template using carpet tape, and cleaned it all up. First I used a flush trim bit with a top mounted bearing. Then switched over to a flush trim with a bottom mounted bearing to finish the last little bit. There was a small amount of tear out – don’t know if this was my technique or the cherry’s fault. Important lesson learned – less is more when it comes to carpet tape…It took quite a while to pry the template off the blank. At around midnight we decided to wrap it up for the evening. The body is close to final dimensions here, just some minor sanding to clean it up. 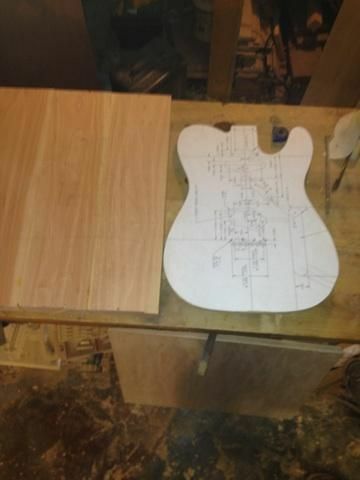 Now that the body is close, the next steps will be to create a second template, based on the first, for routing out the two pickup holes, the control knobs, and the neck pocket. That cherry is going to age nicely and quickly, it would be neat to see some time elapsed pictures over a few years of this guitar. 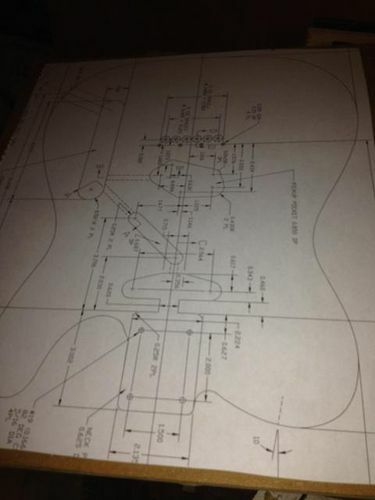 Now I’m inspired to build a amp head out of cherry, I scratch build LOUD 100 watt tube amps. By the way if you put a pick guard on that guitar I will mock you! I’m pretty excited to see how the cherry ages. I’m on the fence about the pick guard…I’ve seen some cherry tele’s that look money without pick guards…but I’ve seen some that look great with them too. I’ve got one ordered just in case. 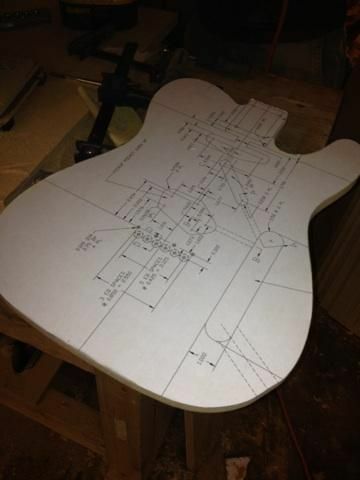 I want to lay it out on the guitar before I do any routing so I can see how it will look. BACK away from the pick guard slowly and don’t make any sudden moves! Very cool. I’ve almost completely ditched guitar playing for woodworking. Can’t seem to make time for both. This will be fun to watch. I’m not surprised that the jigsaw didn’t quite do the trick on cherry. Must’ve been like trying to hack down a tree with a wet noodle. Darth – That’s funny man. BTimmons – that about sums it up.